1995-1999 - Attendance for McNichols Arena, Denver, CO. 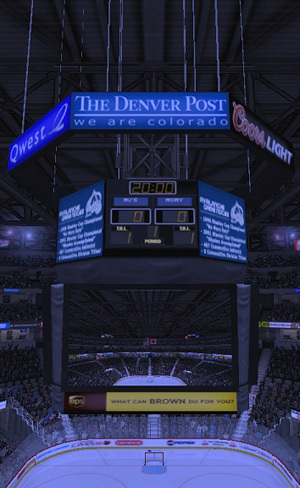 The groundbreaking for the Pepsi Center (Pepsi Cola is the title sponsor) is tentatively scheduled for early 1996 with the home opener planned for October 1998. Construction is scheduled to begin in early 1997. The arena is to be built by team owner Ascent Entertainment, along with a television studio in downtown Denver, adjacent to the new Elitch Gardens theme park in the area between Speer Boulevard and Auraria Parkway. It will seat 18,129 for hockey and 19,100 for basketball and will include 95 luxury suites. The estimated cost is $132 million. There will be 95 luxury suites available for lease for the duration of sport seasons. * A 60,000-pound scoreboard hung at center court. July 27, 1997 - Charlie Lyons is anxious. He's standing near a billboard-sized poster for "Air Force One" at a splashy premiere party last week in Denver as friends and associates enthuse about the movie's prospects. "You don't know," Michael Klein, director of the Colorado Motion Picture and Television Commission, tells Lyons. "You don't know what's going to happen to you when this movie hits." Lyons smiles, nods, shrugs. Plays it cool. "You just don't know," Klein repeats. But Lyons does know this. "Air Force One," which stars Harrison Ford and opened on more than 4,000 screens this weekend, is his bid to be a player in Hollywood and possibly change the fortunes of his Denver-based company, Ascent Entertainment Group Inc.
A box-office smash could help push Ascent toward profitability after posting losses of $57 million in the past two years. A particular drain has been the dismal financial and on-court performance of Ascent's Denver Nuggets. Lyons' negotiations with Denver to build the Pepsi Center sports complex have languished for two years, pushing Ascent's projected cost for the new arena from $132 million to $160 million. Lyons has taken the heat, but he also has shown the ability to catch lightning in a bottle. He brought the Quebec Nordiques to Denver in 1995 for $75 million. Renamed the Colorado Avalanche, the hockey team won the Stanley Cup that season, giving Denver its first pro sports championship. "Air Force One" is Ascent's first shot at making a blockbuster summer movie. The $120 million action picture, produced by an Ascent subsidiary called Beacon Communications, could be a huge hit, the equivalent of a Stanley Cup. If not, the pressure on Lyons will mount. The movie, the Pepsi Center and Ascent's recent split from parent company Comsat Corp. are all converging to push Lyons to center stage in Denver and Hollywood. It's his moment to make or break. An Achilles' heel for Ascent is the financial condition of the sports teams. The Nuggets and Avalanche have lost an estimated $13 million over the past two years. While losses are somewhat easier to swallow when Avalanche players hoisted the Stanley Cup last year, the Nuggets situation is much different. Last year, the basketball team posted a 21-61 record, with many empty seats in the stands. "It's the part of the business that causes me the most pain," said Lyons. Ascent already has a sponsorship deal with PepsiCo Inc. for the Pepsi Center reported to be worth more than $60 million over 20 years. The soda money doesn't flow to Ascent, however, until the facility is built. 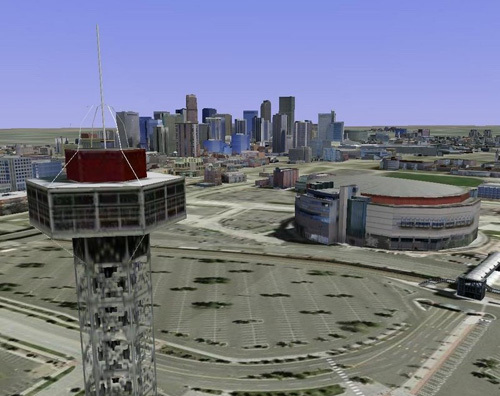 July 29,1997 - Ascent will not break ground on the proposed Pepsi Center sports arena in Denver by August 31, 1997, causing it to default on, and renegotiate, a $200 million credit line with NationsBank. August 5,1997 - Mayor Wellington Webb "broke bread" with Ascent Entertainment President Charlie Lyons during a Sunday breakfast meeting to talk about the proposed Pepsi Center. "There's positive movement toward a deal, but it's not ready yet," Webb spokesman Andrew Hudson said Monday. "Throughout the course of negotiations, they've met from time to time." Ascent wants to build the $160 million arena next to Elitch Gardens amusement park for its Denver Nuggets and Colorado Avalanche. But Ascent has to negotiate with Denver to break its McNichols Sports Arena lease and get tax breaks for the new private arena. "They broke bread," Ascent spokesman Paul Jacobson said. "The relationship is good." Sources have told The Post that the deal essentially is done. The mayor shared breakfast with Lyons less than 24 hours after returning from a two-week vacation in Greece. Webb leaves Denver today to give a speech at a conference involving his college fraternity in Detroit. The Pepsi Center is tied into the football stadium debate. Once the arena deal is complete, it opens the door for McNichols Sports Arena to be demolished and a Broncos stadium to be built on the Big Mac site. But Gary Lane, director of Denver theaters and arenas, said McNichols should be kept because it could potentially play host to 100 annual events - even after the Pepsi Center opens in 1999. Lane said the city of Portland kept its municipal arena after a new facility opened for the NBA's Portland Trail Blazers. Webb, however, has said that McNichols can be torn down. August 13, 1997, Denver Post Online - Ascent Entertainment and the city of Denver pledged a 25-year union Tuesday, giving the professional sports franchise owner a chance to build a money-making arena and Denver another jewel for its Central Platte Valley renaissance. Ascent's two teams, the Colorado Avalanche and the Denver Nuggets, will leave McNichols Sports Arena and move into the $160 million Pepsi Center next to Elitch Gardens Amusement Park by the fall of 1999. Unlike many pro teams that are asking taxpayers to underwrite stadiums and arenas, Ascent is building its own facility. The arena, which will hold 18,100 fans for hockey and 19,300 for basketball, is expected to be under construction sometime in October. Denver gets the civic peace of mind of knowing the Avs and Nuggets are committed to the Mile High City for a quarter-century. Just as important, the city receives a compensation bundle of $13 million to $17 million from Ascent for the life of the 25-year pact. "Everyone did not get what they wanted and everyone did not lose what they wanted," said Peter Bowes, a private real estate appraiser who helped negotiate the deal for Denver. "But overall, it's a good package. "The big picture is the Avalanche and the Nuggets will play in the facility for 25 years," he said. "It maintains the image of Denver as a four-sport town and the number one sports town in the nation. All this would be at risk without the new facility." The bottom line for Denver officials is that they needed Ascent to pay off lost revenue to the city for breaking its lease early at McNichols Sports Arena. Seat tax from games at Big Mac are paying off bonds for other Denver-owned venues. 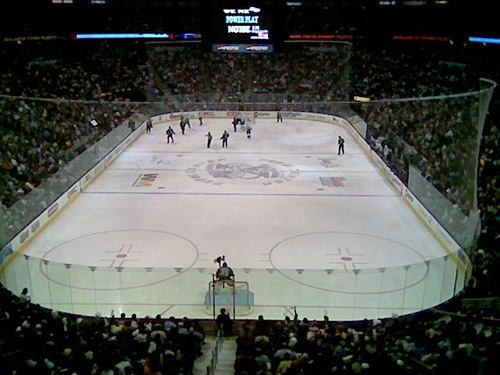 The Nuggets were obligated to play at Big Mac until 2006, while the Avs have renewed their lease through at least the next season. Driving Ascent was its need to open a revenue-generating arena as quickly as possible to stem the financial bleeding of its sports franchises. In an era when teams skip town for the sweetest stadium deal in another city, franchise owners use their venues like ATMs to pay players million-dollar salaries. Denver controls Big Mac's destiny. If the city decides to level the 22-year-old arena off Federal Boulevard within four years after the Pepsi Center opens, Ascent will pay some of the demolition costs. For each year that McNichols remains open, Ascent will pay less and less of the razing expense. The future of McNichols could hinge on whether a new football stadium is built for the Denver Broncos. If voters agree to help finance a new football stadium, it would be built near McNichols and Mile High Stadium. Until that time, Mayor Wellington Webb said the city will conduct a feasibility study to find out if McNichols can serve a niche in a city that already owns the Denver Coliseum. Denver Theaters and Arenas Director Gary Lane is lobbying to save McNichols, noting the city of Portland has a new, high-tech venue for its Trail Blazers and also an older arena that was retained and is currently operating in the black. Ascent President Charlie Lyons needed to be assured that McNi	chols - if it's kept - would not steal business from the Pepsi Center. "We don't want people to think that the Pepsi Center is Ascent's arena and that McNichols is the city's arena. We want people to think that the Pepsi Center is the city's arena," Bowes said. "The only difference is that Ascent will build, own and operate the Pepsi Center." Ascent will pay from $1 million to $2 million annually to Denver, depending on the new arena's attendance for an anticipated 160 annual events. Those payments include sales tax on items sold at the arena. "This is a protection for the city," said Bowes, noting the city will receive at least $1 million a year even if there is poor attendance. Denver will pay $4.5 million for infrastructure improvements that are expected to cost $5 million to $5.5 million. Ascent pays the balance. Work includes extending Wewatta Street to the site and building a pedestrian bridge to link the new arena with its neighbor, Elitch Gardens. Denver will pay Ascent $2.25 million in a sales tax rebate during the two-year construction phase. In addition, Ascent will pay the prevailing wage to construction workers. Ascent is also responsible for cost overruns. Ascent is aiming to open the arena for the 1999-2000 basketball and hockey seasons. The venue for Tuesday's announcement was the dimly-lit second-floor rotunda of the City and County Building, where about 150 reporters and officials jammed the room to hear an announcement that carried as much pep as a late-season Denver Nuggets game. After three years of often stressful talks, Webb and Lyons displayed little emotion. Prodded by a reporter about why neither showed relief nor jubilation, Webb cracked, "What do you want us to do, sing a duet?" Webb then let loose with a "Yee haw" that echoed in the rotunda, before explaining, "This has been a difficult deal." Lyons acknowledged there should have been more joy in the room. "We ought to be smiling," he said. While Webb and Lyons drew the media glare, it was actually their foot soldiers who hammered out the details during the past five months after relations hit rock bottom last year. During the low points, the mayor quaffed soda from a Coca-Cola can to illustrate his dismay over stalled talks, while city officials revealed its Pepsi Center offer in hopes of baiting Ascent to the bargaining table. City Council President Cathy Reynolds said negotiations stalled last year when Ascent was undergoing some internal corporate changes. Reynolds, the council's se	nior member, recalled a time when both sides thought they had locked up a deal only to return from lunch to hear from Ascent's side that the agreement had crumbled. "I always knew there was a deal to be made," she said. "Ascent had to wait until its corporate stuff was sorted out. It was just not in a position to make 25-year commitments." Others were dumbfounded by the time it took to reach a deal. "I wonder what in the hell took so long," said Denver-based sports consultant Dean Bonham. "There's nothing earth-shattering here." But a foursome turned the contentiousness into nuts-and-bolts negotiations that made progress since March 1. For the city, it was Bowes and private lawyer Tom Ragonetti. On Ascent's side, project manager Tim Romani and lawyer Steve Farber carried the ball. After Tuesday's announcement, Bowes and Romani posed together for photos, both sporting wide smiles. There's more Pepsi Center hoopla today when Webb and Lyons are scheduled to sign the proposed deal at an 11 a.m. ceremony in the same city hall room. Today is also the deadline for the Avalanche to decide whether the team can keep its star center, captain Joe Sakic. After Sakic signed a $21 million offer sheet with the New York Rangers, the Avs were given a week to match the offer. Even after Webb and Lyons sign the deal today, the pact must then win the blessings of the Denver City Council and Ascent's board of directors. Plus, Denver agencies must grant permit approvals before earth can be moved for the five-level arena. Ascent Entertainment has extended until Monday the closing deadline for Donald Sturm's purchase of the Pepsi Center, the Denver Nuggets and the Colorado Avalanche. The deal has been delayed while the city and Sturm spar over language intended to keep the teams at the newly-opened venue for 25 years. While both sides had been publicly polite about the discussions, claiming a solution would be found, city officials left Tuesday's negotiating session with one Denver attorney saying, "We ain't doin' this deal." Still, the attorney said negotiations would continue. Sturm wants to buy the teams and the Pepsi Center from Ascent Entertainment, but for the city to sign off, Sturm was also required to take on Ascent's 25-year lease. Because Sturm is an individual, not a corporation, the guarantee must be structured differently. A corporation can be bound by a long term agreement, but if an individual dies, the restriction becomes subject to debate. While Sturm had no problems with the 25-year pledge, its structure posed the problem. Details of the agreement were not disclosed, but the city earlier suggested putting a lien on the building and teams, setting up a trust that includes the city as a beneficiary and provisions in Sturm's will and company's organizational documents. The day before the agreement was reached, a local investment group said it was prepared to buy the Pepsi Center, Nuggets and Avalanche from Ascent Entertainment if the company could not reach an agreement with Sturm. Sturm won a bid in July by offering $461 million for the package. A group headed by Bjorn Erik Borgen, which lost the bid by offering $438 million, says it is willing to make the purchase if Sturm and the city can't agree. The closing was scheduled for Oct. 31, but was extended to Nov. 10 in hopes of working out a solution. If an agreement is reached, the Denver City Council could not act on the proposal until its next meeting Nov. 22. 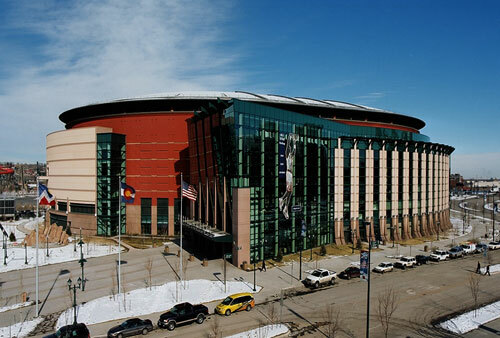 Opened in 1999, the beautiful Pepsi Center is the home of the Colorado Avalanche and the NBA Denver Nuggets, and replaces the old McNichols Arena which has since been demolished to make way for the new NFL venue - Invesco Field at Mile High. The arena sits just on the outskirts of downtown Denver, within easy walking distance of the LODO entertainment district, and adjacent to a Six Flags Amusement Park. The center is easily served by an elaborate highway network, bringing in traffic from the interstates as well as local streets coming in from downtown. Numerous large surface lots surround the building, and are coded by letter for premium, season ticket holder and general parking, as well as a media parking lot and a VIP parking lot offering valet parking and a separate club entrance ($40 for VIP parking here, smashing the $30 record we encountered at the Metrodome in Minneapolis!). Otherwise, colorful banners and flags adorn each light post, and the building is attractively landscaped and boasts a stunning appearance - red, copper and brown brick facades interspersed with a massive glass wall which faces out onto the downtown side. It is this glass pavilion which serves as the two entrances to the building, the main one opening into a spectacular six story glassed atrium, which you access by walking through an attractive plaza. This walkway's signature piece is a five piece sculpture, the centerpiece being a pedestal and globe in the shape of the Pepsi logo. At night the four obelisk shaped pieces beam lights into the sky, which meet high up and serve as a beacon to visitors and passersby. Lastly, in addition to street vendors, people giving away pins and signs, and radio station booths, just outside the main entrance is "Coors Meadow", an outside area cordoned off and availing fans of pregame refreshments, entertainment, ice sculpting, face painting and music. With the Stanley Cup Finals in full swing, you can add local, national and worldwide media to the mix, and what you have is a community street party. Where else would one rather be?! The amazing and dramatic atrium lobby is just the beginning... off to one side is the "Pepsi Center Trading Company", the official team store, and straight ahead are the escalators taking you up to the main concourse... enjoying the view of the downtown skyline on the ride up, of course! All the concourses are bright, attractively decorated, and spit shined. Mosaic marble tile flooring is illuminated not only with recessed lighting but also track lighting. The concession stands have appealing marquees - bright and colorful. One can also find scoreboard type marquees while walking around, matching up to the game clock inside and also a bank of monitors so as not to miss a minute of the action. To get you up and down there is one bank of four escalators on the atrium side of the building. Until we walked into the seating bowl, the Pepsi Center was a candidate for our coveted 5 star award. But the seating bowl was somewhat disappointing. First... the positives. We start, of course, with the 360 degree LED surround board which hangs from the club level balcony. Dazzling, colorful, and compared to other setups we have seen elsewhere, we have to commend the Avs for using the graphics and technology to the max! Constant special effects, cool graphics and a show in itself! The bowl is set up almost identically to ours in Buffalo and newer venues elsewhere - lower, club and upper levels, and here there are two levels of suites, above the 100s and a second ring above the clubs. All the seats are colored dark brown, and this lends to sort of a drab appearance. The scoreboard is a sharp four sided video board, and above the video panels are four sided dot matrix boards that are one colored and grainy (Jennifer Smith, former Sabres marketing guru whose career has since nosedived, must have consulted the Pepsi Center on this one). Hanging high in each corner from the rafters are shots on goal boards and stat boards that are mismatched and decidedly low tech - as if the Avs bought these panels at the Three Rivers Stadium garage sale. We didn't get access to club seating, and hope to have a report on this area when we return to see the Denver Nuggets later this year. We do want to mention, however, that the suites are not served by their own separate concourse, and in the case of the lower level suites, their doors spilled right out in to the 100 level concourse, similar to Tampa's Ice Palace configuration. Here we have to speak of this venue in extreme superlatives... the food choices here were overwhelming! As we walked the aisles, we had a hard time finding the same items at two different places. Carved sandwiches, cheese curls, pot roast sandwiches, buffalo burgers, fajitas. What was hard to find here was the standard ballpark dreck. hot dogs and nachos. Each concession stand marquee was decorated with a sign featuring its specialty item/theme. Best of all, for ballpark prices the food items here were comparatively reasonable in cost. They have to be, for not much left in the wallet after shelling out those 40 beans to park, eh? This is what made the evening magical.. Yes it is the Stanley Cup Finals, so how much more jacked up can the fans be right? The Avalanche dimmed the lights at 20 minutes before the hour, and began their elaborate music presentation, light show and highlight videos. We had no connection to this team, yet the entire presentation gave us chills. We got choked up as we reminisced at the excitement and giddiness we all felt in Buffalo when our Sabres made their run to the finals just two years ago. The show here was reminiscent of the crescendos in Buffalo, and here it reaches its exciting finale as a large rocky mountain is dropped from the ceiling (a la oil derrick at Edmonton's Skyreach Centre), and the Avalanche players skate out through the mountain and onto the ice. Pyrotechnics, LED board flashing and pom poms waving. What a show!!! What a night!!! Unfortunately for the home team, things went downhill from here, and the Devils played a nearly flawless defensive game to upend the Avs 4-1. There would be no tipping over cars or smashing storefront windows in LODO on this night. The Avalanche display their division/conference and one Stanley Cup banner. The Nuggets have retired four of their greats, some dating to their ABA days. The Avs used a series of clever 10 second video clips of stars from the Broncos and the Rockies, exhorting the fans to cheer, get crazy, get wild etc. These clips were used during faceoffs and at strategic times. Might the Sabres recruit Bills and Bisons stars to do the same? Mind you, these type of clips should be used sparingly - playoff games, or maybe when the Leafs come to town. The first THANK YOU goes to Ron Bertovich for getting the ball rolling for the tickets. From, there, the roadtrippers acknowledge JOHN SINCLAIR, VP ticket operations for the Sabres, and ROB WINSTON, Ticket Director at the Colorado Avalanche for securing us our tickets and getting us into the building. We want to make this VERY clear - we are very much aware of the demand for tickets and are very appreciative of the trouble that many people went to on our behalf. We are pleased to announce that John Sinclair and Rob Winston have both been inducted to the Ultimate Sports Road Trip Hall of Fame. THANKS TO EVERYBODY FROM THE BOTTOM OF OUR HEARTS!